I am feeling thankful today. Maybe it is the new year. Maybe it is because I was going through old pictures and reminiscing. 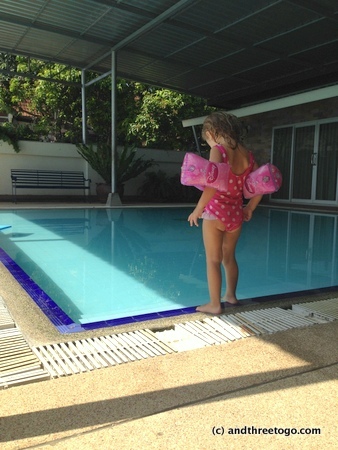 Maybe it is because I spent time with my awesome little family and traipsed around Phuket in the sun today. It is probably all of those and more. Today I want to share with you what I am thankful for. I am glad to be alive. I am ultra-thankful for Jesus and His salvation. I am thankful that I have the freedom to believe that and to share it openly. I am blessed with a fun-loving, artistic, loving husband that loves to travel as much as I do. Everyday, I am thankful to be living the life that Chad and I have chosen to live together. Living in Thailand and traveling the world these past two years have been amazing, a dream come true. I am thankful for family that loves and support us three that are far away. Without them, there wouldn’t be an us. And without all of you, my lovely readers, there wouldn’t be an And Three To Go. So THANK YOU! I am thankful for the opportunity to get to know you all. I am thankful that you keep reading these posts and participating in conversations with me across the interwebs! Now for some pictures. I hope you enjoy them and have a great Monday! Z testing the water at our favorite pool near our house. She thought it was okay, I was freezing! I am getting too acclimated I think. It may be time to visit somewhere cold I think… maybe a place that is even below 20°C (68°F)! 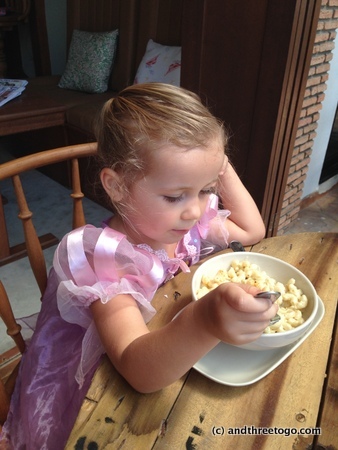 Z… ahem, pardon me… Rapunzel loving some Mac ‘n Cheese at one of our new favorite restaurants, Java Junction Bistro. 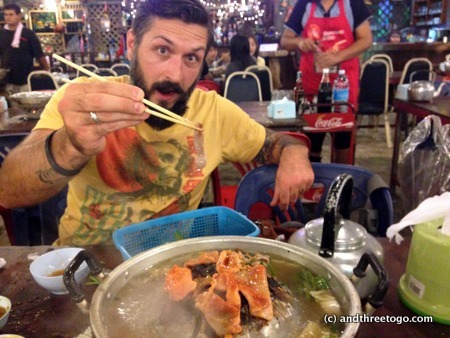 Chad being the master chef at our favorite Thai BBQ buffet right near our house. All-you-can-eat marinated pork, fish, seafood, beef, chicken, and vegetables that you cook right at your table… It’s so delicious! Now it’s your turn! What are you feeling thankful for today?I know it’s Monday, but there has to be something, right?! Leave a comment and join in the fun! This was wonderful and encouraging to read, Jenny — thank you for sharing! I am so glad that it was! Thanks so much for reading and commenting! 🙂 Have a wonderful day! I always need reminding to be thankful. 🙂 I admit I have been feeling off as of late and suddenly today something just clicked and I felt downright grateful to be alive. Nothing too exciting happened, just our normal life. I love when that happens. I hope you have an awesome day full of things to be thankful for! Oh yes! My life has been full of late and I have much to be grateful for..hopefully the rest of the year will be good to me..
Good point about the meltdowns. They are learning and growing into their own person. Something for me to remember too. My Zoe would love your Zoe’s Rapunzel dress, she is her favorite! That BBQ place sounds so awesome! Today I am thankful that my family is finally well enough to leave the house (long weekend)-Now for some grocery shopping! Have a great week! Great post Jenny – sometimes we just need to take a moment and remember to be thankful! I should do that more often. The Thai BBQ looks mouth wateringly delicious too!! It really is! I would eat it every night if I could. 🙂 Thanks, Joy! Good pictures. The pool looks cold to me! Give me full sun! Ha ha! I’m glad you had a “grateful spurt!” I love those. I am grateful too. For so many things. Today it is a vacation and a healthy baby and a clear head. I wish I had that BBQ place! My husband might cook for me! But I am grateful, he always opens my crab legs when we eat them! Ha! Woohoo! Vacation is awesome! And a healthy baby… Even more awesome! lovely pics yet again. gratitude is a great way to start the week off! Thank you! Hope your day is fantastic! You know it’s funny… People here love saunas as well. I always think “we live in a sauna” hahah. I can imagine it’s great after a workout! Oh I like that! Well said! Have a great day Sue! Gratitude posts never get old and we should always strive to remember to be thankful. Lovely post, Jenny. Thanks Lani! Btw… have been reading your book! I am loving it! The story in the prologue… Oh my goodness… So funny! 🙂 Anyways thanks for writing it. 🙂 I will definitely be reviewing it when I finish. Indeed! I feel the same way. Thank you! Have a wonderful day filled with lots of yummy food. 🙂 (Still thinking of your recent post about the restaurant… *drool*). Every time I read one of your posts, it feels like a vacation. You whisk me away to tropical place and as a reader, I become part of your adventures. I love it so much. So thank you, I am grateful to have a little sun from your blog on a cloudy January day. I should pause and be thankful a bit more often. So far 2015 seems way rushed. Thanks for the reminder. Busy is fine as long as it feels good and productive. I think that’s been the problem with January so far. Spinning your wheels? I do so hate that feeling. Yes. Yes. That’s the term I’m looking for. I am so glad you found me! I look forward to greeting to know you! That is wonderful that you can do that with your husbands work! Chad and I have often talked of how we want to live in NYC someday. It must be amazing! It’s a bit stressful and hectic, to be honest (not to mention expensive!) but trying to make the most of it while caring for an infant (so, no swanky rooftop parties, dancing till 4am, etc – all that stuff people associate with the NYC life). 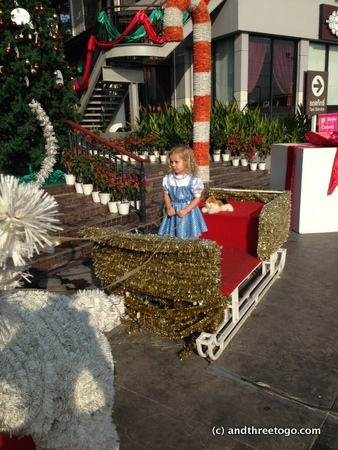 We visited some bits of Asia (Hong Kong and Japan) before the baby and loved it but sadly haven’t been to Thailand yet. One day! I have heard that it’s that way, which is one of the reasons we haven’t ever been, but hopefully we will get to visit someday soon.